0.1 Washington Harbour (map) Several outdoor cafes along the waterfront. 8.4 Cabin John (map) Cabin John Shopping Center (at MaCarthur and 79th St) located about 0.5 mile away from river (Deli / Store). Cross lock and follow wide path to left. Becomes paved Riverside Ave. Follow thru tunnel and continue 79th St.
14.3 Great Falls Snack Bar (map) Hotdogs and burgers. Located in large parking area. 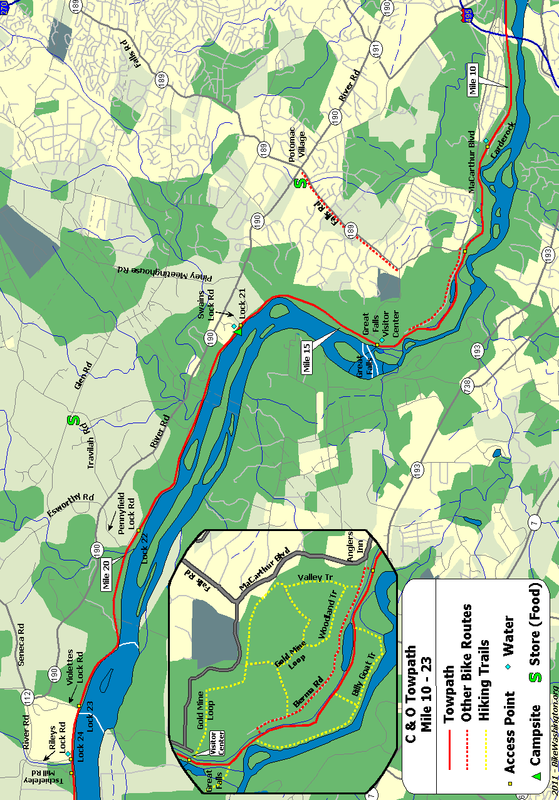 35.7 Whites Ferry (map) 301-349-5200: Bike/auto access to Leesburg, VA via Ferry (Fee). Soda, snack food available. 42.1 Dickerson Market (map) 301.349.5789: Food and Grocery Market located about 1.5 miles from the towpath in Dickerson. 22145 Dickerson Rd. 48.2 One Stop Deli and Grocery (map) 301.874.2691: Small Deli located in Exxon, about 0.7 miles from Towpath (just past the train station). 48.2 Deli on the Rocks (map) 301.810.5782: Just off the towpath in Point-of-Rock, MD. Breakfast, lunch, and dinner. 3710 Clay St.
55.0 Beans in the Belfry (map) 301.834.7178: Popular internet cafe located 0.3 miles from towpath in old church. Offering coffee, sandwiches, soups, salads, and WiFi. Go past the railroad station and turn left at the light. Just past the top of the hill near the bridge. 122 West Potomac St.
55.0 King's Pizza (map) 301.834.9999: Go past the railroad station and turn left at the light. Just past the top of the hill one the other side of the bridge. 215 West Potomac St.
55.0 Potomac Street Grill (map) 301.969.0548: American, Tex-Mex, and Middle Eastern food. 31 E Potomac St.
55.0 Smoketown Brewing Station (map) 301.834.4828: Enjoy a brew at the town's former former fire station. Feel free to bring your own food or visit any of our town's great restaurants (King's Pizza is right around the corner). 223 Potomac Street. 60.7 Harpers Ferry Dining (map) Numerous restaurant options on the block across from the railroad station. Coffee, delis, pubs, self serve, ice cream. Mostly lunch and dinner options. Online ratings favor Cannonball Deli and Private Quinn's Pub. 72.8 Route 34 Bridge Large Parking Area, about 0.1 mile downriver from bridge. Restaurants located across river in Shepherstown, about 3/4 mile. 72.8 Shepherdstown Dining (map) Numerous dining options in this university town, including pizza, Chinese, and Thai. Cross bridge and ride up the hill. Left at 4-Way stop onto W German Street. 72.8 Blue Moon Cafe (map) 304.876.1920: Popular pub just one block off the beaten path. Corner of Princess & High Streets. 76.8 Barron's Store (map) A long time fixture on the canal, now owned by the Tyler Family. Offering cold drinks, packaged snacks, and ice cream. Open on weekends only. 76.8 Battleview Market (map) 301.432.2676: A bit off the trail, but the deli here is a great food option when visiting the Antietam Battlefield. 5331 Sharpsburg Pike. 140.8 Bill's Place (map) 301.478.2701: This bar is a longtime favorite stop along the towpath. However, hours have been irregular this season. Grill closes at 8pm. 140.8 Little Orleans Campground (map) 301.478-2325: Private Campground - RV and tent sites 1/4 mile from the towpath. Showers, pool, camp store. 156.2 Paw Paw, WV (map) General Store and Quick Mart. Located about 1 mile from towpath, across the river, via Route 51. 166.7 The School House Kitchen (map) 301.478.5189: Restaurant and Community Center located in the old high school. Opposite direction from the toll bridge. Right at the tee, and the kitchen is one block on the right. 173.3 Spring Gap Recreation Area (map) Primitive RV and Tent Camping - Fee Area $10/night. Store located on Route 51. 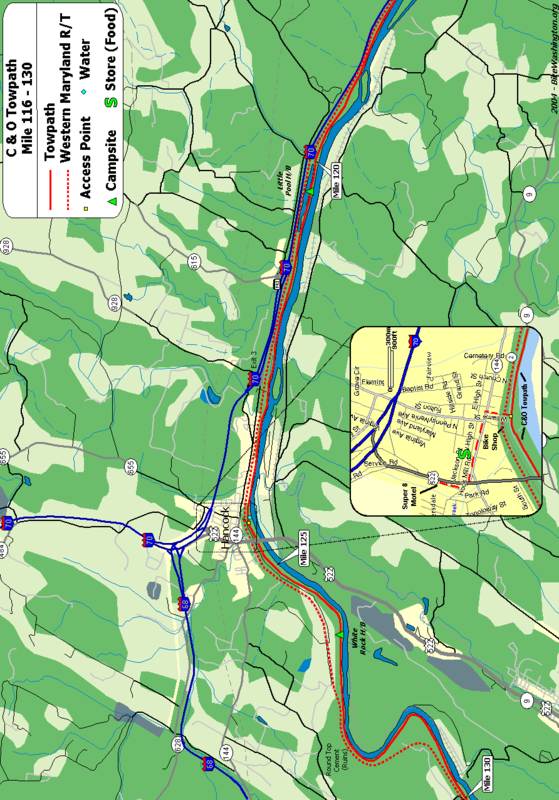 184.5 Cumberland, MD (map) Trail heads for both the C&O and GAP trails. Several restaurants nearby; Continue north past the historic railroad station, then turn right at Baltimore St.
184.5 The Crabby Pig (map) 301.724.7472: You've just completed 185 miles. Have a beer! Right near the Fairfield Inn. 13 Canal St.
10.8 Carderock Recreational Area (map) Picnic, rest rooms, water. Very easy access from I-495. 11.5 Footbridge Water on opposite side of canal. Access to MaCarthur, 0.1 mile west of Brickyard Rd. Loading only - No Parking. 22.8 Rileys Lock #24 Parking and access to River Road. 26.0 Horsepen Branch H/B Hiker/Biker campsite. 1.2 miles from vehicle access at mile 27.2. 47.6 Calico Rocks H/B Hiker/Biker campsite. 0.8 miles from vehicle access at mile 48.2. Located near a busy railroad line, so earplugs are suggested. 50.3 Bald Eagle Island H/B Hiker/Biker campsite. 0.5 miles from vehicle access at mile 50.8. Located near a busy railroad line, so earplugs are suggested. 62.9 Huckleberry Hill H/B Hiker/Biker campsite. Remote - No nearby vehicle access. 90.9 Opequon Junction H/B (map) Hiker/Biker campsite. Remote - No nearby vehicle access. 95.2 Cumberland Valley H/B (map) Hiker/Biker campsite. Remote - No nearby vehicle access. 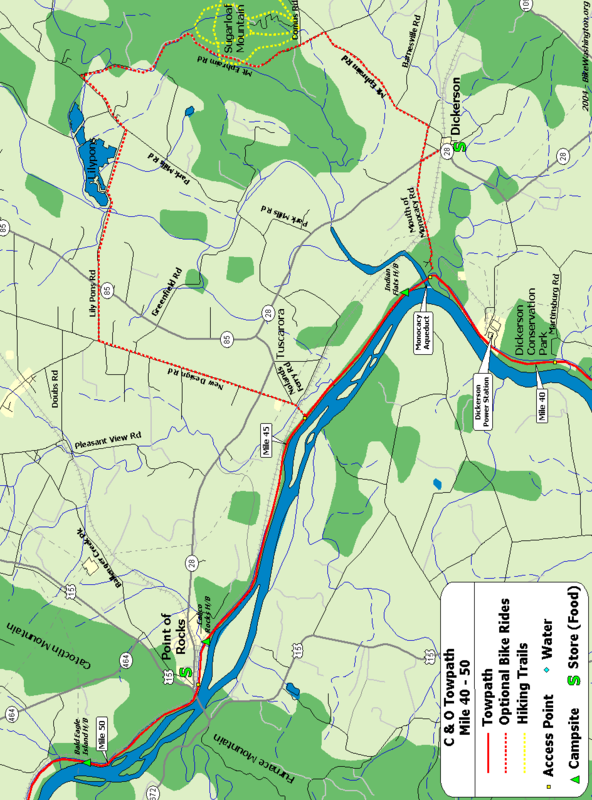 112.1 Fort Frederick State Park (map) ​301.842.2155: Massive pre-revolutionary fort. Easy access from towpath. Water is available from hydrant, just 20 feet past the railroad crossing on the left. 116.0 Licking Creek H/B Hiker/Biker campsite. 1.5 miles from vehicle access at mile 114.5. Located Near I-70 - Subject to traffic noise. Earplugs suggested for camping. 120.4 Little Pool H/B (map) Remote Hiker/Biker campsite - No vehicle access. Located Near I-70 - Subject to traffic noise. Earplugs suggested for camping. 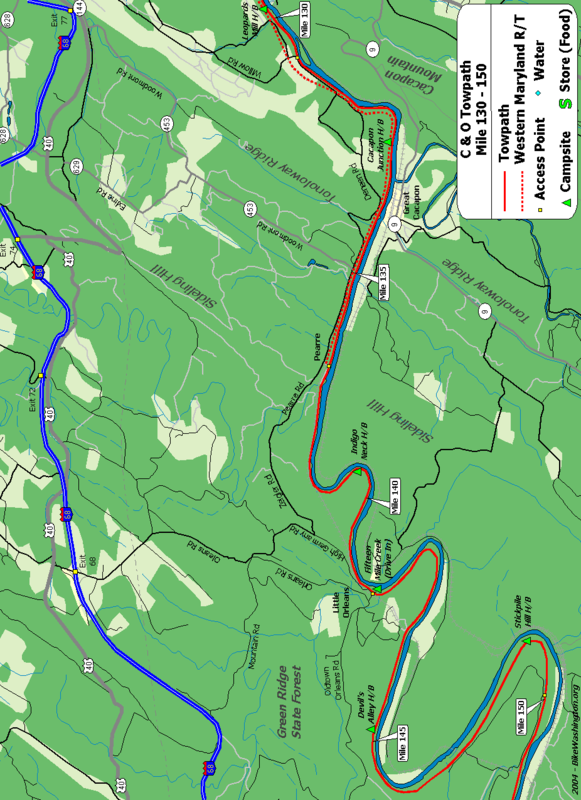 133.6 Cacapon Junction H/B (map) Remote Hiker/Biker campsite - No vehicle access. 140.8 Fifteen Mile Creek Recreation Area (map) Fee Area: $10 to $20. A Drive-in site with RV and tent sites (Primitive Facilities - No RV Hookups). Free parking available alongside railroad embankment. 144.5 Devil's Alley H/B (map) Remote Hiker/Biker campsite. No vehicle access. 164.8 Potomac Forks H/B Remote Hiker/Biker Campsite - No vehicle access. 169.2 Pigmans Ferry H/B (map) Remote Hiker/Biker campsite - No vehicle access. 175.4 Iron Mountain H/B (map) Hiker/Biker campsite. Access from nearby Route 51. Located near active railroad trestle. Earplugs suggested for camping. 11.5 Marsden Tract Campground (map) 301.299.3613: PERMIT REQUIRED - reserved for civic/scout organizations only. $20/night. Call for permit. 99.4 Jellystone Park (map) 301.223.7117: Private Campground - Full Service RV and Cabins. Located 2 Miles south of Williamsport along Route 68. Showers, pool, camp store. 99.4 Hagerstown KOA (map) 301.223.7571 : Private Campground - Full Service RV and Cabins. Located 3 Miles north of Williamsport along Kemp Mill Rd. Showers, pool, camp store. 151.1 Three Otters Eco Retreat (map) 304.947-5446: Some really unique lodging options are available, just across the river from the towpath. They also offer convenient canoe ferry service. 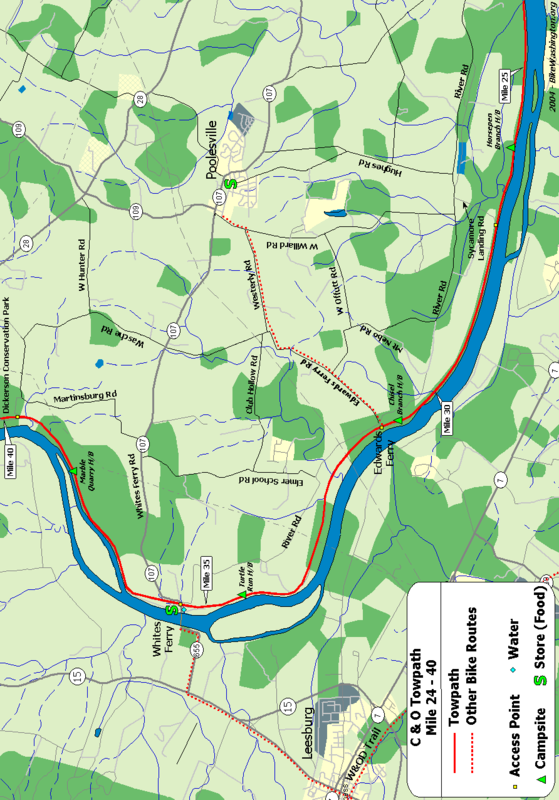 166.7 Camp Potomac (map) 301-729-1300: Private camping facility 1.5 mile from the canal. Open to scouts and other youth groups. Two cabins and eight campsites available. Email bsapotom@gmail.com for reservations. 0.1 Washington DC Hostel (map) 202.737.2333: Located at 11th and K Streets, NW (near the Convention Center). 5.4 Lockhouse 6 Stay overnight in a real lock house. Modern kitchen, bath with shower, central heat and AC. Book online. 8.8 Lockhouse 10 (map) Stay overnight in a real lock house. 1930s kitchen, bath with shower, central heat and AC. 19.7 Lockhouse 22 Stay overnight in a real lock house. Rustic, no heat, electricity, or running water. In fact, 3 miles from nearest water source. 30.9 Lockhouse 25 (map) Stay overnight in a real lock house. Rustic, no heat, electricity, or running water. Nearest water is 0.3 miles downriver at campsite. 35.7 Best Western (map) 703.777.9400: Leesburg: 726 E Market St. Bike friendly hotel very near the W&OD trail. Free hot breakfast buffet, free upgraded Wi-Fi, and free shuttle to and from White’s Ferry! 35.7 The Leesburg Colonial Inn (map) 800.392.1332: Leesburg: 19 South King St. A 10-room Bed-and-Breakfast, centrally located in downtown Leesburg, VA. Two blocks from the W&OD trail, and many nearby restaurants. 35.7 Comfort Suites Leesburg (map) 703.669.1650: Located in Leesburg, VA, right next to the W&OD trail. Offers a "Ride and Stay Package", and free shuttle service from the trail. 80 Prosperity Ave SE. 49.0 Lockhouse 28 Stay in a real lock house. Rustic, no heat, electricity, or running water. Nearest water is 1.4 miles upstream. Close proximity to active railroad, so earplugs are a must for sleeping. 55.0 Georges Mill Farm B&B (map) 540.822.5224: Lovettsville, VA - about 5 miles south along Route 287. 60.7 Econo Lodge (map) 304.535.6391: 25 Union Street, Harpers Ferry, WV - about 1.5 miles from towpath. From the historic area, follow Shenandoah St to Rt 340, then go right on the wide shoulder for about 100 yards. Hotel will be on the right. 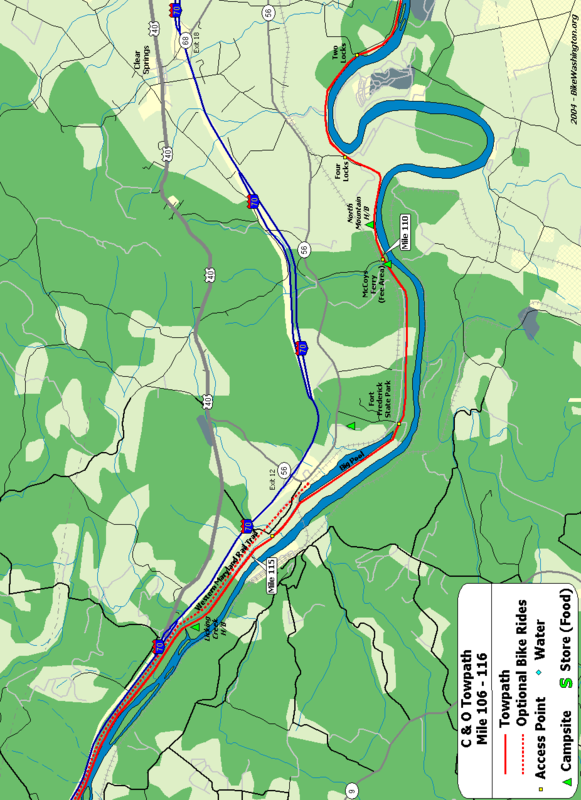 This avoids the hill on Washington St.
60.7 Teahorse Hostel (map) 304-535-6848: Located 1 mile from the Towpath. Price includes breakfast. Locked storage for bikes. 1312 West Washington Street, Harpers Ferry, WV. 72.8 Bavarian Inn (map) 304.876.2551: Directly across river via Route 34 Bridge. Probably one of the nicest places to stay along the towpath. 72.8 Clarion Hotel (map) 304.876.7000: On the far side of town, past the Thomas Shepherd Inn. 72.8 Comfort Inn (map) 304.876.3160: Cross Route 34 Bridge. Right onto Route 45. Located on right at 2001 Maddex Square Drive. 76.8 Jacob Rohrbach Inn (map) 301.432.5079: A Bed and Breakfast in Sharpsburg, MD - About 1 mile from trail, near Antietam Battlefield. 138 W. Main St.
76.8 Inn at Red Hill (map) 301.730.2620: Located about 6 miles from the canal, not far from Antietam National Battlefield. Shuttle service available. 4936 Red Hill Road, Keedysville, MD. 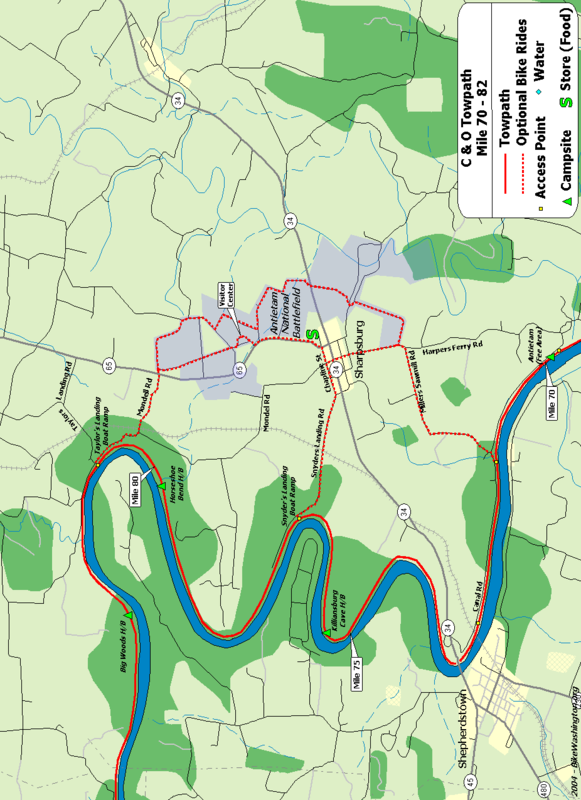 99.4 Bay Farms Bed and Breakfast (map) 301-875-5032: Located in downtown Williamsport, just two blocks from the towpath. 14 N Conococheague St.
99.4 Elmwood Farm Bed & Breakfast (map) 240.707.0772: A relaxed and comfy farm stay experience, located 2.5 miles outside of Williamsport, MD. Shuttle service available. 16311 Kendle Road. 108.7 Lockhouse 49 Stay overnight in a real lock house. Electricity with baseboard heating and stove, but no running water. Water pump nearby. 124.1 1828 Trail Inn (map) 301.678.7227: Hancock, MD - Bed and Breakfast located just one block from the trail. 10 West Main Street. 124.1 Riverrun B&B (map) 301.678.6150: Probably one of the closest accommodations to the towpath, and several recommendations from 2010 travelers. 7 South Taney Street. 124.4 Super 8 Motel (map) 301.678.6101: Hancock, MD - Travel one block away from river and turn left on Main Street. Hotel is located on far side of overpass. 140.8 Town Hill Hotel B&B (map) 877.696.2794: Located on top of Town Hill Mt providing beautiful vistas. About 8 miles from Little Orleans. A shuttle service is available, with multiple pickup points. But for extra credit, bike the 1,300 foot climb yourself! 140.8 Little Orleans Lodge (map) 301.478.2102: We always seem to receive "comments" about this place (take that as you will). About 1/2 mile from towpath on Appel Road. The room accommodations are nice, but suggest you avoid the breakfast due to persistent unsanitary kitchen issues. 156.2 Wrenwood Inn (map) 304.947.5983: 107 Winchester Street, about 0.5 miles from the towpath in Paw Paw, WV. 156.2 Bikepath Bed and Bath (map) 304.947.7236: A lower cost lodging option in Paw Paw, run by a C&O Canal Steward. Fully licensed, health dept. inspected, clean and well reviewed. 109 Winchester St.
184.5 Fairfield Inn (map) 301.722.0340: Located right next to the trail, just south of the interstate. 184.5 9 Decatur Guest House and Hostel (map) 240.727.7039: A more economical lodging option. Operated by the Mountainside Bike Tours and Inn on Decatur folks. 0.3 Start of Towpath Just south of the Pennsylvania Ave and Rock Creek Pkwy intersection. Continue downstream via the Rock Creek Bicycle Trail. 1.6 Georgetown University (map) Access via tunnel underneath the Canal. Near intersection of Canal and Foxhall Roads. 5.0 Lock #5 Modern footbridge over parkway to Ridge Drive near the corner 61st Street. 12.4 Old Angler's Inn (map) Popular free parking area across from Old Angler's Inn on MaCarthur Blvd. VERY Crowded. Access to optional Berma Rd route. 22.1 Violettes Lock #23 This lock also marks the end of the watered canal basin. With a few exceptions, the canal basin is mostly abandoned upstream from this location. 27.2 Mckee-Beshers Wildlife Area Remote access via Sycamore Landing Rd, 0.75 miles from River Rd. Public hunting area. In July, check out the Sunflower fields during peak bloom. 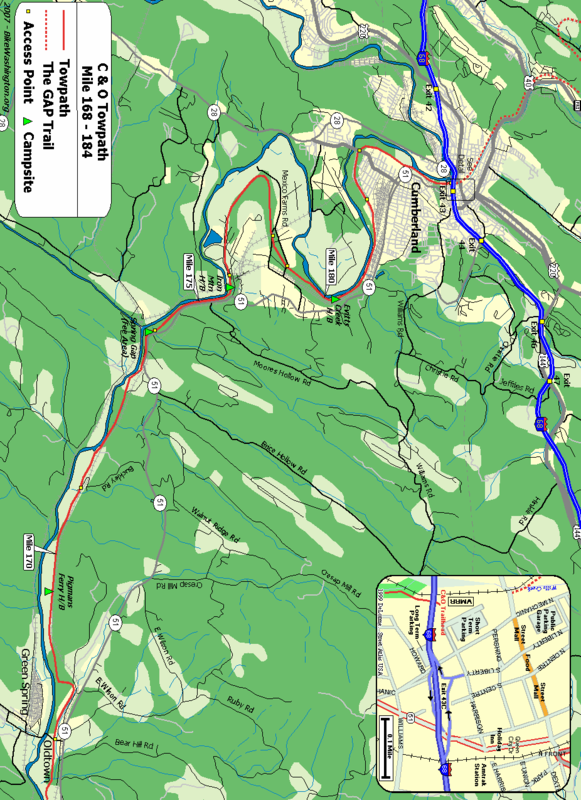 39.5 Dickerson Conservation Park (map) Access from Martinsburg Rd. 42.1 Monocacy Aqueduct This impressive structure is the largest aqueduct on the towpath. Originally completed in 1833, was restored in 2005. 44.6 Nolands Ferry Boat Ramp and Picnic Area. Access from New Design Road. 48.2 Point of Rocks, MD This town marks the location where the Potomac river cuts through the Catoctin Mountain ridge. The Route 15 Bridge provides alternate bike access to Virginia (when Whites Ferry is closed). 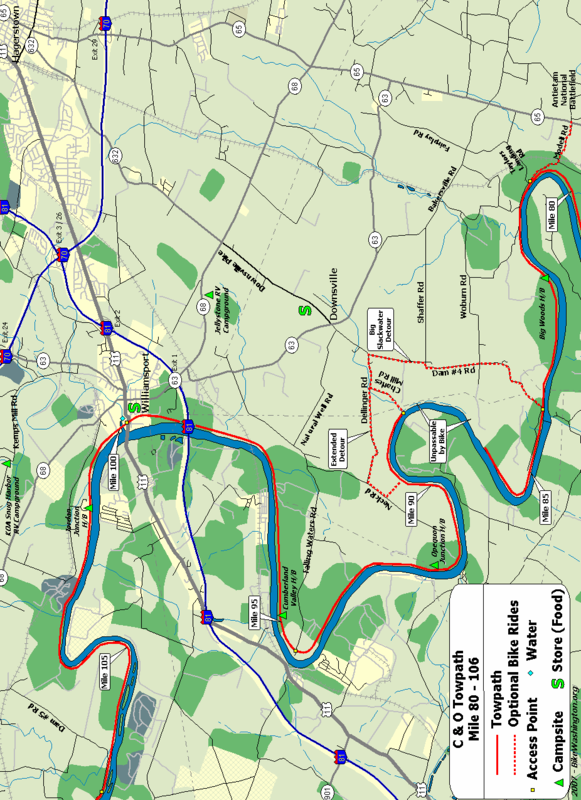 Note that Route 15 is very hazardous and NOT recommended for bicycle access to Leesburg. Use state route 665 instead. 58.0 Appalachian Trail The famous 2,181 mile long hiking trail that runs from Maine to Georgia. 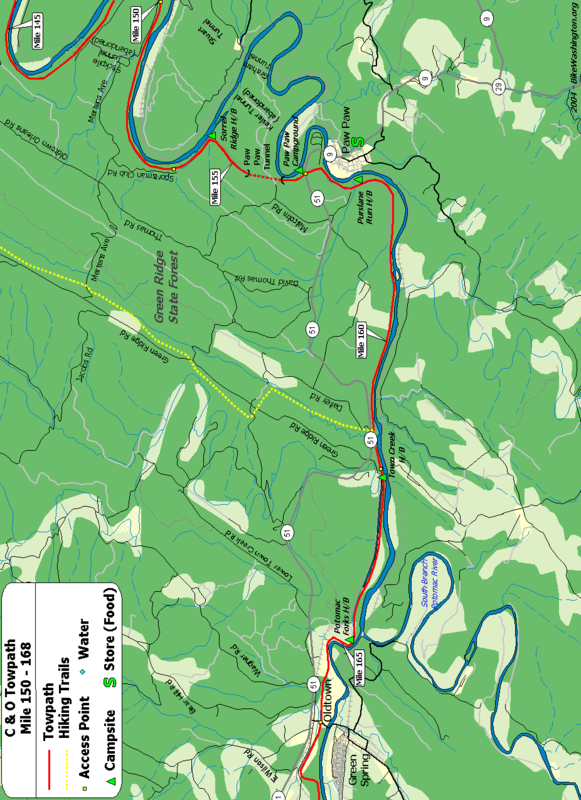 The trail comes down off South Mountain, and follows the towpath upstream for about 3 miles, leaving at Harpers Ferry. 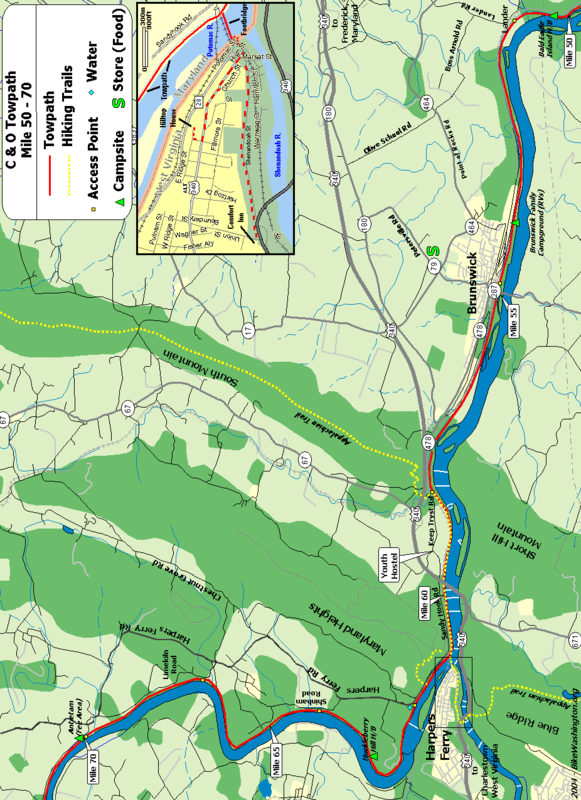 60.7 Harpers Ferry, WV (map) Access via footbridge. National Historic Park. Railroad Station, serving Amtrak and MARC (No bicycles on trains). 93.8 Potomac Fish and Game Club 301-223-9871: Private club. Public access may be restricted. 99.4 Williamsport Visitor Center 301.582.0813: National Park Service Visitor Center. Great displays inside the Cushwa building. 106.6 Feeder Dam #5 Access via Dam #5 Road - Parking Area. 108.6 Four Locks Large parking area, boat ramp. 150.0 Bonds Landing Rustic access point from Kasecamp Road. Four wheel drive may be required.